Hunched over the top tube of my Surly Long Haul Trucker, I looked at my haggard face in the handlebar mirror. My eyes looked glassy and distant, as if they’d been plucked from a corpse. Smears of dirt ran across my face in the early evening mist, like a widow’s mascara at a funeral. A raindrop, in the shape of a small tear, landed on the mirror. I watched it creep down, pause at the edge, then drop onto the steep mountain road that loomed before me. 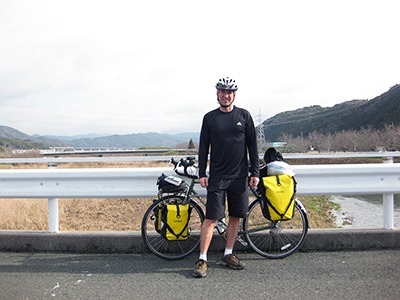 This was my first extended bicycle tour, which would end up being a 1,000 kilometer ride through parts of the Kanto, Kansai, and Kyushu regions of Japan. I was on my way to Nara city before continuing on to Osaka where I would catch a ferry to Kyushu for the majority of the cycling trip. I had just cycled over seven hours through Mie Prefecture and was now stuck on this deserted mountain road somewhere in the Kasagi Mountains, approximately 10 kilometers northeast of Nara city, searching for a campsite I had circled in my Kansai Mappuru guidebook when planning the trip from home weeks before. I thought of home now back in Kanagawa, and my wife Rui, who would be sitting at the table eating dinner at about this time. Make sure you take pictures of the deer in Nara, she would remind me every evening. I finally arrived at the top of the mountain. Instead of a campsite, however, I found a deserted family restaurant—a seasonal operation I suspected. I stood straddling my bicycle in its vacant parking area. Okay, I thought, I will continue on to Nara city no matter how late it becomes. I looked out over the forests, through steadily increasing rain, and thought of Nara Park, home to the hundreds of deer that serve as a cultural symbol of the city. I heard a car approaching. A small white van—the first vehicle I’d seen since morning—pulled into the parking area, tires raking over the wet gravel. An old Japanese man with a weathered face stepped out. He wore faded blue coveralls and black rubber work boots. He stared at me with a blank look on his face. “Hello. Do you know if there is a campsite around here?” I asked in Japanese. He ran a hand through his thick white hair. Then he shook his head and mumbled a few things that I didn’t understand. He motioned for me to follow him across the road, up a small embankment and through a clearing to an old storage shed. He unlocked the shed and told me I could sleep there for the night. Inside, stacks of boxes containing what looked like decorations for a summer festival were stacked haphazardly in a corner. Four rows of rusty metal folding chairs leaned against the wall. To the right, there was a second room with an elevated tatami floor where the old man told me I could lay my sleeping bag. He gave a little gesture with his right hand—“carry on”—and then left. I went inside and collapsed on a folding chair, debating whether to stay or to keep cycling to Nara city. 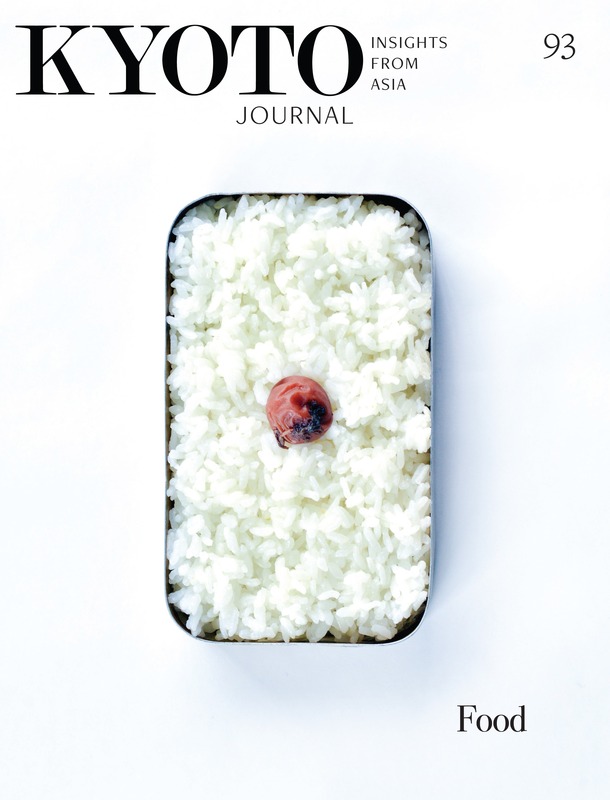 I was startled a few minutes later when the old man returned with two Asahi beers and a plastic container of daifuku—chewy rice cakes filled with sweetened red bean paste. He pulled out another metal chair and we sat together, drinking the beer, eating the sweet rice cakes. “Where are you going,” he asked. 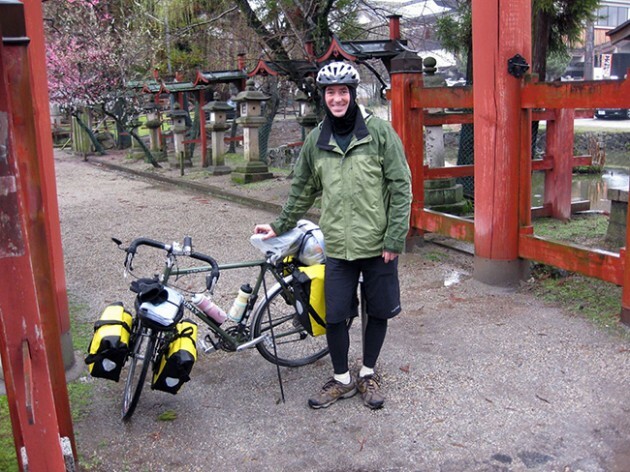 I told him I had planned to stop in Nara city for a day before cycling to Osaka to catch a ferry to Kyushu. “The deer are famous in Nara,” he told me. We each drank our beers, and then he was gone. The beer left me feeling warm and relaxed. I laid out my sleeping bag on the tatami floor. The rhythmic din of the rainstorm outside lulled me into a dreamy, almost hallucinatory state. Within minutes I felt as if I were back on my bike, coasting down a steep hill. Kasuga Shrine, built in 768, still stands in the southeast corner of Nara Park. Legend has it that one of the gods of the shrine arrived from a region near Tokyo, riding through the sky on the back of a white deer. I awoke sometime after sunrise. The rain, mercifully, had slowed to a drizzle and I coasted down the other side of the hill on my way to Nara city to see the deer. I felt a sudden rush of excitement as I picked up speed. I imagined my bicycle as a kind of surrogate for the ancient deer and I was a god, soaring through the sky on its back. I arrived at the tourist information office in Nara city around mid-day. A cheerful college-aged girl called around and booked a room for me in the Super Hotel next to Nara station. After a shower and shave, I set off for Nara Park to finally meet the deer. Walking through the city, I felt as if I had traveled back in time. Residents and tourists walked slowly along the sidewalks. Bicycle taxis peddled by on the street. Everything seemed to be awash in sepia tones, until I came across a beautiful vermilion torii gate marking the entrance to a small shrine, still several blocks from the Park. I asked a man passing by if he wouldn’t mind taking my picture under the gate. He snapped a few shots and we got to talking—he spoke slowly and softly, a voice perfectly suited for Nara, I thought. He was from Shizuoka prefecture, however, and had traveled to Nara by himself for the weekend. I told him I was on a bicycle tour to Kyushu, passing through Nara for the day. “Did you know the deer are famous in Nara?” he asked. Just then, the rain started to pick up again, and he suggested we slip into a nearby yakitori bar for cover. The shop, tucked away in a narrow alley next to the shrine, was simply a counter with seven stools. We squeezed past an elderly man chatting to the Master behind the counter and sat at the far end, on the last two stools. We sipped cold draft beer and worked over the menu slowly. As the afternoon turned into evening, regulars began to drift in and out. At first I had felt cramped, but I came to enjoy the intimacy of the place. Sitting at the counter meant sharing your conversation with everyone. Sometime late that night, I finally said goodbye to the man from Shizuoka, the Master, and the regulars at the counter. I stepped outside into a puddle that glistened with the reflection of the red shoji lantern swinging in front of the shop, as if it were waving farewell. I woke up the next morning shortly before checkout. It was still raining outside. I cycled to a convenience store to grab some breakfast before the relatively short, 40-kilometer ride to the ferry terminal in Osaka. I stood outside under the store’s awning, sipping a hot can coffee, when I realized I hadn’t seen the deer yet. Do I have time to pedal up to the park for a few quick pictures before making my evening ferry in Osaka, I wondered. A small gray truck pulled into a parking space in front of where I stood. The driver looked to be around 40, my age. He sat in his truck for several minutes looking out at me. Then he reached over and picked up something from the passenger seat, got out of his car, walked over and handed me a mikan—a Japanese tangerine. “Ganbatte,” he said with a quick nod and walked into the store. I ate the mikan outside under the awning, with the rest of my coffee. When the man returned, he jumped into his truck, flashed a quick smile, and drove away. As I wiped off my saddle before pedaling away, I leaned over and looked at my face in the handlebar mirror. I noticed a smirk, the kind you might find on a mischievous child holding back a secret. I got on my bicycle and pedaled out into the rain toward Osaka, to catch my ferry, content that I had seen all I needed to see in Nara city. Brian Rugen grew up in the mountains of Colorado, but has spent the last 13 years bouncing back and forth between Japan and Hawaii. He teaches in the Department of Languages and Applied Linguistics at Hawaii Pacific University.